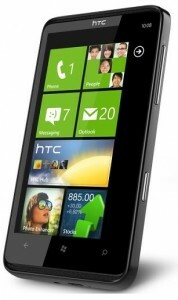 HTC today announced HTC HD7, a new Windows phone 7 based smartphone for global customers. HTC HD 7 an upgraded version of the HTC HD2 smartphone which currently uses Windows mobile 6.5 platform. Earlier this year, HTC had announced that HD2 will not get upgrade to Windows phone 7. The main reason for this was its external hardware limitations. As you can see from the photos, HTC HD7 has only three front buttons, search, back and menu. HTC HD7 the largest sized Windows phone 7 smartphone launched at the Windows phone 7 event held at USA. HTC HD7 has a 4.3 inch capacitive touch screen ( S-LCD , 480 x 800 pixels, 16M colors) display with multi-touch input support. The external dimensions and the design of the HTC HD7 looks very similar to the HD2. HTC HD7 has the default Microsoft Windows phone 7 user interface. It has Zune, Windows Azure, XBOX live and social networking integration with extensive support for the cloud technology. The applications, mail, visual contact list (people), all can be accessed from the phone home screen by scrolling down. The new internet explorer in HTC HD7 is fast, and it supports multiple windows, multi-touch and pinch to zoom in pages. The 1GHZ processor in HTC HD7 makes the browsing, working with OS transition effects, and moving through apps and options very easily. HTC HD7 has an HTC hub application at home screen that let you access the features like weather ( as seen in HTC Sense), stock updates, etc. The HTC HD7 has a 5 MP camera with auto focus and dual LED Flash, which also support HD video recording at 720p. There is a kick stand above the camera section that you can use to watch movies and videos. HTC HD7 includes 2 – front facing stereo speakers and has inbuilt Dolby and SRS surround sound software for excellent music playback. HTC HD7 will be available in 8 GB and 16GB storage options. The external build of the HD7 is strong with a good plastic and metal finish. There is a Micro USB port, 3.5 mm headphone jack, camera button and volume rocker in the sides. This quad-band GSM phone supports HSDPA and HSUPA enabled 3G networks. Other features of HTC HD7 include Bluetooth with A2DP, WLAN, A-GPS, Youtube client, social networking apps, new version of Microsoft Pocket Office and 1230 mAh battery. T-mobile will launch HTC HD7 in USA, before this Christmas. Sources suggest that price of HTC HD 7 in USA would be around $199 with two year contract. 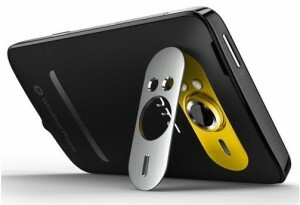 Europe and Asian countries will also get HTC HD7 ( contract free in some countries) this year or at the beginning of next year. The expected market price of HTC HD7 in India is around 30000 INR. We will update you with more details, as soon as they are available. Updated: Amazon has listed HTC HD 7 in their German store. The suggested market price is $830 with latest exchange rates. Update: HTC HD7 will be available at T-mobile USA stores, from November 8 for a price of $199.99 and with 2-year contract. when is it gonna be avalible in Asia? Any service center in Asia-Philippines particularly..and can the OS be transformed to Android….optionally? i love the phone and will love to get one.But i want to the price and how to pay. This phone (HTC HD7) does not having front facing speakers. It has one on the rear and two front grills which cover the earpiece and microphone. HTC launched the HD7 *officially* phone today. But the funny part is that I bought this phone from this wellknown site mnvcollections.com more than a couple of weeks ago and have been using it. So how can HTC claim that it is being launched in India today? Strange, na?